Papaya fruit offers not only the luscious taste but is a rich source of antioxidant nutrients such as carotenes, vitamin C and flavonoids; the B vitamins, folate and pantothenic acid; and the minerals, potassium and magnesium; and fiber. Together, these nutrients promote the health of the cardiovascular system and also provide protection against colon cancer. The fruit is valued for its proteolytic enzymes including papain, which is used like bromelain, a similar enzyme found in pineapple, to treat sports injuries, other causes of trauma, and allergies. The milk like juice from unripe fruit called latex, contains the most concentration of papain, enough some people say to remove freckles. 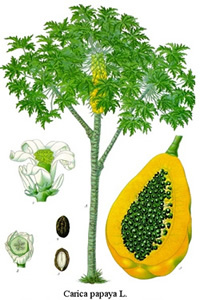 Preparation Methods & Dosage :Papaya is an edible fruit, and the leaf can be brewed as a tea. Often taken in extract and capsule form. Papaya Side Effects: Not for long term use - can have a strong laxative effect. The papaya fruit, seeds, latex, and leaves contain carpaine, an anthelmintic (antiparasitic) alkaloid which could be dangerous in high doses. 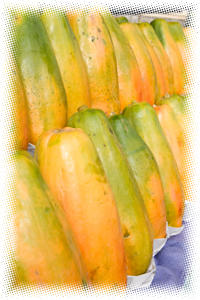 Native to Central and South America, papaya is a yellowish orange fruit that makes great juices, jellies and preserves. 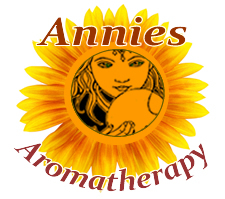 The fresh leaves are used as a substitute for soap and as a dressing for wounds. Related Species North American pawpaw is a different species, in the genus Asimina.